A few weeks ago I wrote a post about my evening routine with Cohen. So I thought I would follow up with our morning routine. We had over 20 views on our last post (Which for a newbie is a lot), and it made me realise how much it must have really helped. I remember when i was pregnant i would spend hours of a night sat reading people experiences and ideas for pregnancy, labour and caring for a little one. 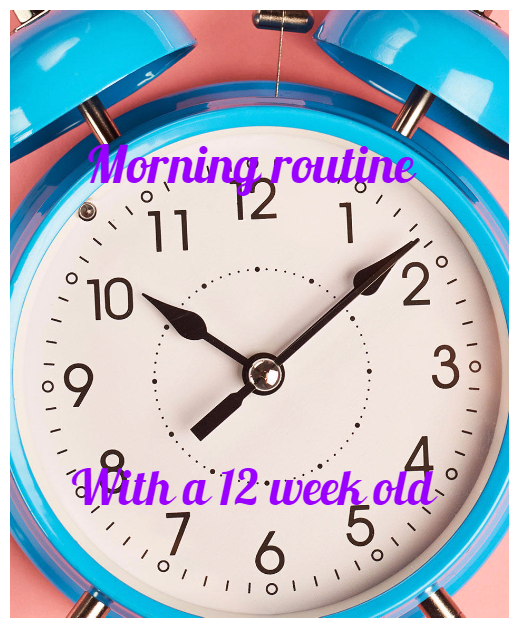 Should you want to read our night time routine please click here!! My day normally starts about 6:30am. This can either be through Cohen waking me up or by my body clock. If Cohen is awake I would take him downstairs with me and put him in his bouncy chair whilst I make his bottle. Around 7:30am Cohen would normally be finishing a bottle. After I have done this is, I take him up to his room to change his nappy and to also get him dressed. He would usually then be quite tired so i would put him down for a sleep. At 8:00 am, once Cohen is asleep I will get myself dressed and begin to make a start at tidying up. By about 9 am Cohen is normally awake and is starting to get hungry. So I bring him down stairs once again and sit him in his bouncy chair in the kitchen with me. He is quite happy to sit and watch you poodle around cleaning, as long as i am dancing along to some silly nursery rhyme or singing a song ridiculously high!! At about 12 ish Cohen will wake up and we will change his nappy!